Hazmat storage should be stored properly and compliantly. Hazmat can run the risk of serious accidents if stored improperly. Hazmat storage buildings are a safe and compliant way to store hazardous materials. According to the EPA: “Hazardous chemicals are any substances for which a facility must maintain a Material Safety Data Sheet (MSDS) under the OSHA Hazard Communication Standard, which lists the criteria used to identify a hazardous chemical. MSDSs are detailed information sheets that provide data on health hazards and physical hazards of chemicals along with associated protective measures. Over 500,000 products have MSDSs which are normally obtained from the chemical manufacturer”. Making sure all of your hazardous materials are stored in hazmat storage buildings is very important. Many risks associated with hazmat storage can be dangerous such as skin burns, skin rash, oral damage and even fatality. We provide our clients with the highest of quality chemical storage buildings to contain and maintain their hazmat storage. Our hazmat storage buildings provide exceptional strength and maximum security for all of your hazmat storage needs. Fabricated from hand-welded, heavy-duty, 12-gauge steel for superior protection. U.S. Chemical Storage buildings are fully customizable and have everything from doors, lighting, temperature controls, mechanical ventilation, fire suppression, sensors, wide variety of electrical accessories, racks, containment sump and more.U.S. Chemical Storage has the options and accessibility to becoming your most reliable building ever. Keep your chemical storage safe and maintained with a flammable chemical storage building from U.S. Chemical Storage. We offer expert advice on how to store your flammable liquid storage or flammable solid storage. 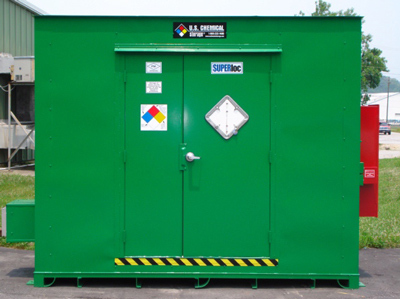 Our flammable storage buildings offer protection for flammable storage and can withstand extreme conditions. We offer a wide range of customizable accessories for your chemical storage buildings to maintain your chemical storage and stay compliant. Built from heavy-gauge steel metal for superior protection. 2-hour fire rated and 4-hour fire rated offers protection for your flammable chemical storage.